When you arrive in the flat driveway of Paradise Point, park your vehicle, grab your bags, and step through the front door to officially begin the Smoky Mountain vacation of your dreams. 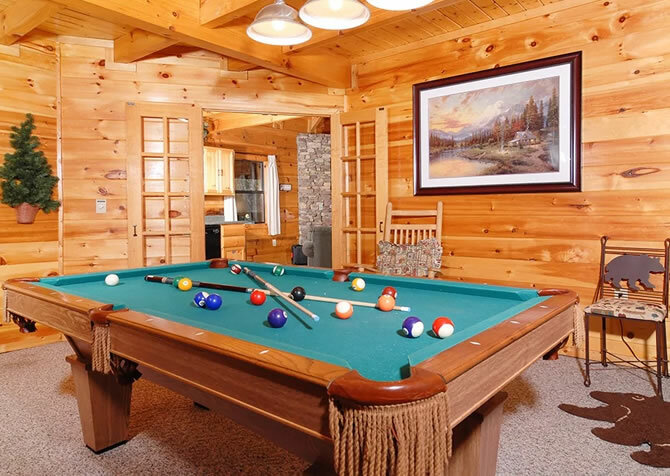 The all-pine interior and tall ceilings will welcome you inside as you settle in to your Gatlinburg vacation home. 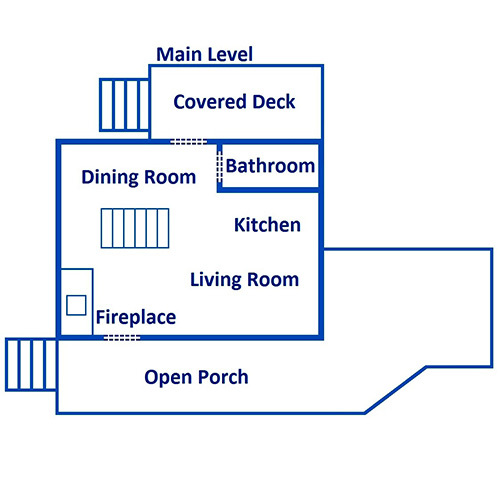 Call this Gatlinburg cabin rental home as your begin to let all of your worries, stresses, and to dos fall away! 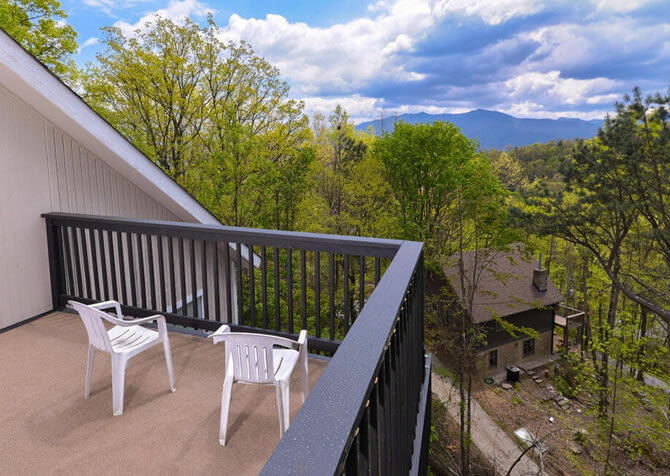 This 2-bedroom Gatlinburg cabin rental is furnished with a comfortable and cozy king-size bed and queen-size bed, with space for up to 4 guests. This log canopy bed offers you a wonderful and romantic place to retreat once night falls. Turn on the television to watch a sitcom or catch the news, or simply turn on the bedside lamp and read until you drift off to sleep. When the sun rises, head to the kitchen to prepare a delicious home cooked breakfast. Purchase one of our breakfast vacation baskets to have items stocked in the cabin upon your arrival or visit the grocery store on your way into town to pick up supplies. The kitchen of Paradise Point is fully stocked with everything from coffee mugs to cutting boards. Full size appliances and spacious counters offer you a place to whip up a meal – you’ll feel right at home in this Gatlinburg cabin rental! A dining table sits just off of the kitchen and offers you a place to enjoy a breakfast, lunch, or dinner. You can even order takeout and spend an evening dining in your Gatlinburg cabin rental! Of course, you can always choose to dine at one of Gatlinburg’s great dining destinations, such as the Smoky Mountain Brewery or one of the area’s many pancake houses. After you’ve had your breakfast and cup of coffee, go to the living area to browse the television channels. The living area offer many windows, welcoming the Smoky Mountain sunlight into your cabin rental. A fireplace here will warm you in the winter months, while the comfy couch is the perfect place for an afternoon nap after a hike in the Great Smoky Mountains National Park. 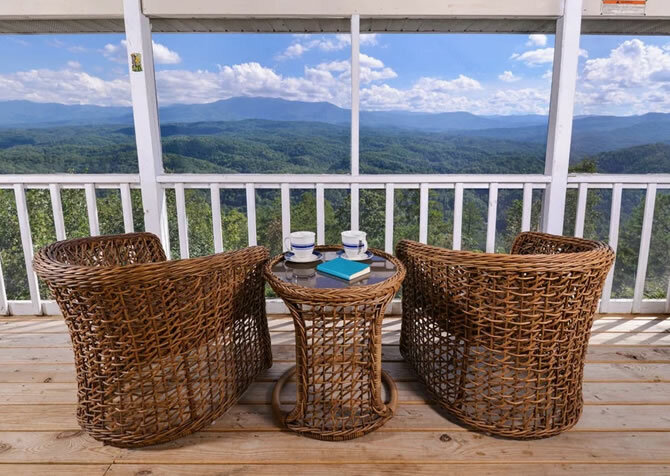 This Gatlinburg cabin rental offers a great view of the Smoky Mountains from the spacious deck. 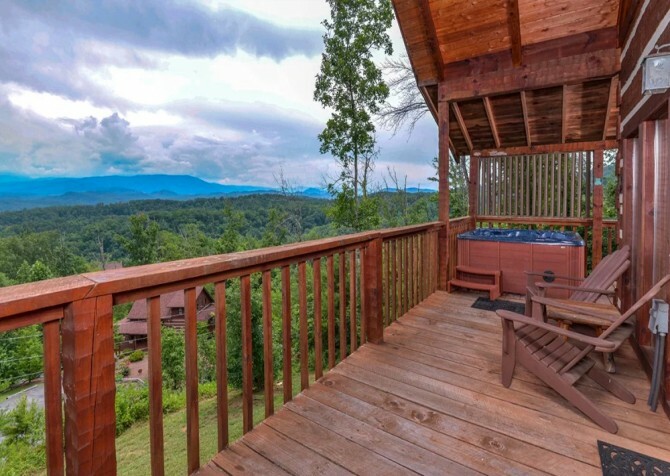 Here you can enjoy the fresh mountain air, watch the Gatlinburg sunrise, or lounge in the outdoor hot tub. Sit on the deck furniture in the evening to gaze at the twinkling night sky as you enjoy some quality time with your special someone. 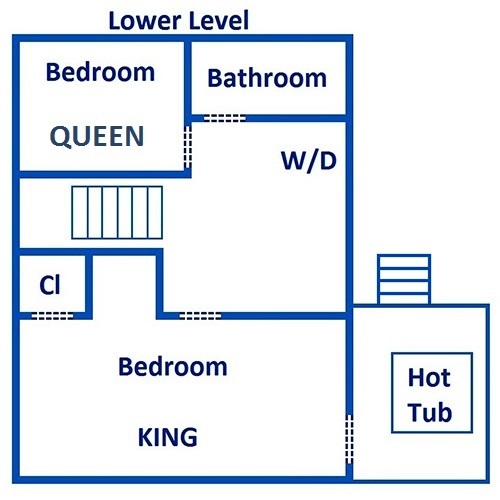 With 1,000 square feet of space, this spacious and comfortable cabin rental is a great escape for couples needing to get away from it all or a small family wanting some quality time. Spend your days exploring the shopping malls of Pigeon Forge or browsing one of Gatlinburg’s many specialty shops. After a busy and fun-filled day, head back to your cabin rental for a cozy night in. You will leave Paradise Point feeling relaxed, refreshed, and ready to plan your next Gatlinburg vacation! "Very cute lil’ cabin! It was perfect for our girls trip. I would definitely stay here again next time I’m in Gatlinburg!" "Loved our experience with Cabins for YOU. We can't wait to go back! All of the information we needed for a successful and worry-free stay was communicated thoroughly through email. We loved it!" "Love the view as well as the drive. The kids thought it was a roller-coaster every time we drove up. "